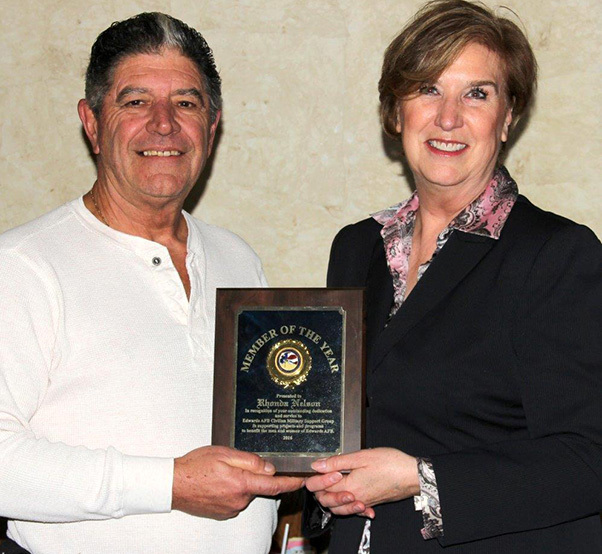 Rhonda Nelson received the Member of the Year award from out-going Civ-Mil president John Fergione recently after the Civ-Mil inauguration banquet. Fergione said Nelson was an easy choice for the award. Rhonda Nelson received the Member of the Year award from out-going Civ-Mil president John Fergione recently after the 2016 Civ-Mil inauguration banquet. Nelson has a special place in her heart for Edwards Air Force Base. “I truly love being a part of the EAFB Civ/Mil Support Group,” she said. “I am very passionate about supporting our military.” Her two twin daughters were born on the base. “It was the first time twins born there in 50 years so we received a lot of attention and special care,” said Nelson. Working at Edwards as an aerospace contractor for Rockwell International and currently as director, Civic Affairs for Northrop Grumman at Air Force Plant 42 in Palmdale, Calif., she has been involved with aerospace for over 29 years. Being a spouse of a retired Air Force chief master sergeant, she frequents the Commissary and Exchange throughout the year. 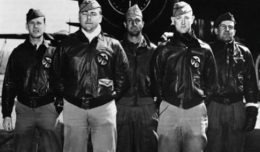 The purpose and general nature of the Edwards Air Force Base Civilian/Military Support Group is to establish a friendly benevolent association of civic leaders and military personnel EAFB to act as a host group whenever needed and additionally, to consider an annual service project to benefit the base. One of those projects is seeking continued donations for Airman’s Attic — a place where airmen can shop for free. Although the Airman’s Attic is open to ranks E-1 through E-6, usually E-1 through E-3 are given priority on larger household items. Hearts Apart is a program designed to offer support to the spouses and family members of deployed personnel. Civ-Mil also helps to provide money for emergency travel and practical needs. They have donated computers, Keurig Coffee makers, video games and other items to help make life a little more enjoyable. Nelson is also a mentor with the American Corporate Partners. The ACP mentoring programs connects post-9/11 veterans (Protégés) with corporate professionals for yearlong mentorships. She was hand selected by ACP and Northrop Grumman to be a mentor to veterans looking to build their next career.